I’ll be the first to admit that gnocchi is one of those things that you might as well buy at the store. It’s cheap, lasts a while, and will just about always be great. Homemade gnocchi is none of those things, so why bother? Either you’ve got something to prove, you’re anti-prepared foods, or you’ve got a pile of purple potatoes just waiting to be transformed. Well, I always have something to prove (haven’t figured out what, just yet), I try to avoid prepared foods unless drunk/on a road trip/dgaf, and indeed, I had some purple spuds begging for attention. What you lack with the traditional gnocchi experience – opening the air-sealed bag and pouring its contents into a pot of water – is the fun of pasta making! I love creating little potato, flour, egg volcanoes, getting my hands sticky with dough, rolling the stuff into long skinny logs, and cutting those logs into adorable little pillows of potato pasta perfection. You can keep your two bucks, Trader Joe’s! Bring a large pot of salted water to a boil. Clean the potatoes and boil until fork tender. Remove the potatoes from the water and let cool for a few minutes. Peel potatoes. Place peeled potatoes in a large bowl and use a potato masher to mash the heck out of them! If you have a potato ricer, that works even better! On a flat clean surface, create 3 separate heaps of mashed (riced) potatoes. Create a hole in each heap and place 1 cup of flour into each hole. Create a divot in the flour, and crack an egg into it. With clean hands, begin pinching at the egg yolk in one of your pasta volcanoes. Continue pinching until some of the flour gets incorporated, and then some of the potato. Eventually, the volcano will collapse. Use both hands to kneed the dough until it has a cohesive texture. Repeat with the other two volcanoes. Separate each ball of dough into 2 or 3 mini balls. Roll these into long skinny logs, about a ½ inch in diameter. Using a sharp knife, cut the logs into 1-inch pillows. 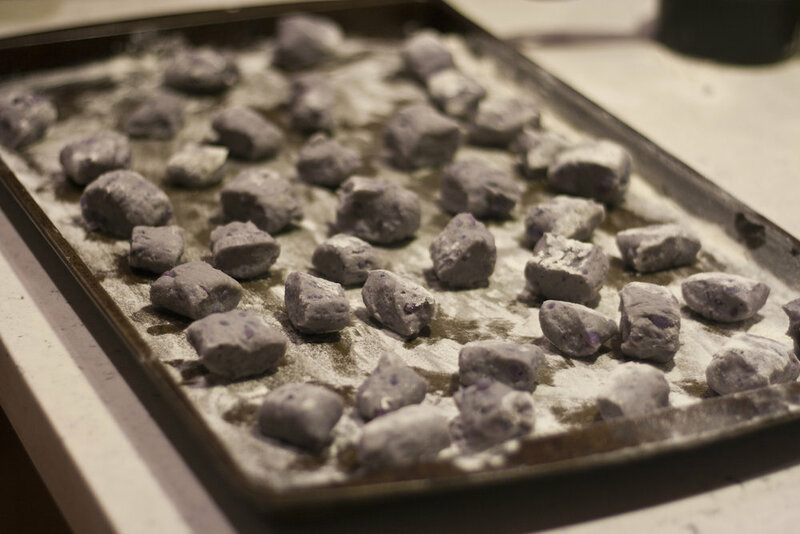 Place the gnocchi on a cookie sheet with some flour and toss to coat them lightly. Keep in the fridge until you’re ready to cook them. When you’re ready, bring a large pot of salted water to a boil. Add the gnocchi and stir occasionally to prevent sticking. Once gnocchi float to the surface, they are ready! Drain the gnocchi and toss with your favorite sauce. If you’re making the rosemary brown butter sauce, simmer the butter and rosemary leaves over low heat. Stir occasionally until butter begins to brown. Pour over your pasta, top with fresh grated Parmesan, and serve immediately.